Audio-restoration software has many uses, including cleaning up transfers of old crackly LPs, and reducing ambient noise in video soundtracks. There are numerous products on the market designed to deal with these sonic issues, and Sonnox’s Restore suite is on the higher end of the available choices. It’s a pro-level toolset that comprises high-quality algorithms and a versatile and wide-ranging set of parameters in each of its three plug-ins. You get Oxford DeClicker for clicks, pops, and crackle; Oxford DeNoiser for hiss and broadband noise; and Oxford DeBuzzer for hums and whistles. Clicks, pops, and crackles are found in all types of recorded audio. You’re most likely to run into them when transferring old LPs, but even in dialog recording and video sound, these sonic gremlins can appear for a variety of reasons. 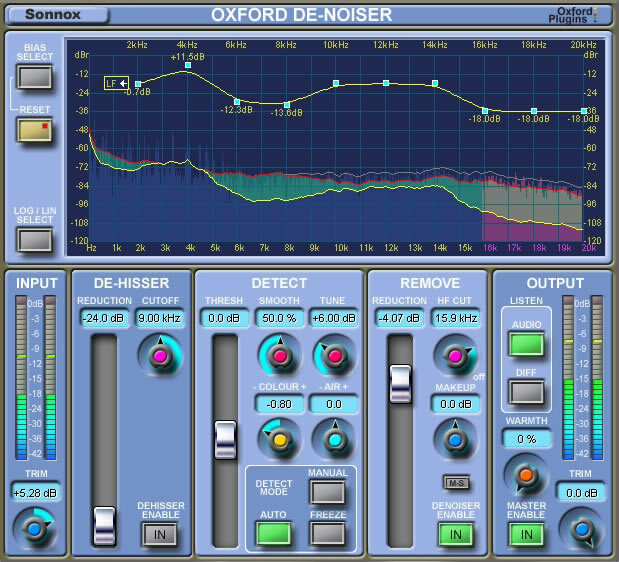 Oxford DeClicker offers a comprehensive toolset to handle all such transient noises. Sonnox defines what is considered a click, pop, or crackle by the length of the event. Pops are between 3ms and 10ms; clicks are between 0.05ms and 3ms; and crackles are anything shorter than 0.05ms. To graphically represent them, each category has what’s called an Excitation Profile, which is like a waveform display with peaks that rise above it to represent the offending events. The upper part of the graphic display is called the Events Graph, which shows bubble-like puffs corresponding with the peaks in the bottom of the display. The green ones are pops, the blue clicks, and the white crackles (see Fig. 1). There are separate sections for addressing clicks, pops, and crackles, each with its own Threshold and Sensitivity controls. Setting the Threshold for each determines the level at which such events will be affected by the removal filters. The Sensitivity slider, which is also available in each of the three event-type controls, sets how much of the detected events will be repaired. A dialog mode lets you set two sets of thresholds: one for when the speaker is talking and one for the background sounds in between. For situations in which the program audio contains events short enough to be mistakenly detected as offending events (horn stabs or drum hits, for example), DeClicker has an Exclude box, which lets you draw in sections on the graph to be excluded from processing. This feature can be fully automated. I tried DeClicker on recordings of spoken word and acoustic guitar, each of which contained clicks, crackles, and pops. For the spoken example, it was pretty easy to set the thresholds to where the offending events disappeared or were reduced heavily (see Web Clip 1). I had to be careful not to turn the Sensitivity up too high, or it started to degrade the audio. This was even more critical when working on the guitar track. Still, for both, I was able to remove or minimize the noise events without degradation. Like the other plug-ins in the Restore suite, DeClicker has input and output attenuation controls, which further add to its flexibility. One other note about this plug-in: You need to set your buffer quite high when working with it, or its processing will impair the signal. Broadband noise can be a real problem, especially for spoken-word recordings and video soundtracks. Unless your signal-to-noise ratio is optimal at all times, you’re likely to have a lot of background noise. If the mic is low-quality, such as the built-in mic on a video recorder, the noise can be quite noticeable, and you might even have to deal with machine sounds from the recorder itself. Often, you also have to contend with other noises such as air conditioners and power tools. When using de-noising software to reduce unwanted sounds, it’s critical to set your parameters correctly, or you can end up with a lot of audio artifacts (often referred to as musical noise), which can ruin your recording and make it sound like it was tracked underwater. Of all the broadband noise reducers I’ve tried, Oxford DeNoiser has by far the most flexible and deep set of controls. DeNoiser gives you several different ways to set the noise profile, which is what the software uses to determine what is noise and what is program material. The idea is to gate out the noise and leave the program material untouched. The key to an effective setting is to make sure you’re not gating much of the program material because that’s when you start to hear artifacts. In DeNoiser, the most effective way to set your noise profile is to isolate a small section of the audio that contains only noise. Loop it and send it to DeNoiser in Auto mode, and the software will calculate a profile for it. Then hit the Freeze button to lock in that setting. The main section of the plug-in’s window displays frequency on the horizontal axis and level on the vertical. A real-time analyzer shows you where the noise is and at what level it’s occurring and being reduced at the various frequencies. You can then vary both the Threshold and Reduction sliders (the latter controls how much reduction is occurring) to find the best combination. As with all three plug-ins in the suite, pressing the Diff button lets you hear only the portion of the audio that’s being affected by the processing, which helps a lot to make sure you’re not reducing too much of your program material. Auto mode looks at the audio signal and guesses what is noise and what isn’t. It’s effective, especially in situations where the noise is variable or you can’t isolate a section of only noise for the software to analyze. The third mode is Manual, which lets you completely set up the noise profile yourself. In all of DeNoiser’s modes, you can fine-tune both the Threshold and Reduction parameters on a frequency-specific basis using the Bias controls. This lets you reduce or increase the processing within specific frequency ranges, allowing you to fine-tune the noise profile. If there’s a frequency range in your program material that is getting degraded by the noise reduction, you can set DeNoiser to ignore (or reduce less) in that area only. Beyond that, you get a lot more options to fine tune your audio. The Smooth and Tune controls are designed to alter the noise profile a bit to help eliminate musical noise. I found their effects to be pretty subtle, but they did help a bit in some cases. The Color and Air controls have more of an obvious impact; the former boosts or cuts the low end of the noise profile, and the latter does the same with the high-frequency material. Experimenting with these will help you fine-tune the noise profile even more. The HF Cut control is a lowpass filter that attenuates 18dB from an adjustable frequency between 1kHz and 22kHz. This can be useful to cut out, say, a high-end whistling or ringing noise. (You can also use DeBuzzer for those types of noises.) DeNoiser also has a dedicated hiss-reduction section for high-frequency noises in situations (usually nonmusical) where there isn’t a lot of high-frequency information in the program material. I tried DeNoiser in a number of different scenarios. For instance, I was able to reduce the background noise on a video with relative ease, without affecting the original recording perceptibly (see Web Clip 2). I also used it successfully on other video soundtracks and on noisy phone-line recordings for a podcast. One thing to bear in mind with broadband de-noisers: No matter how well they work, they can’t produce miracles. If your audio track is upside down—that is, the noise is louder than the source audio—you’ll never get a fully satisfactory result. I found this out when trying to fix the soundtrack on a video of a pianist playing at a jazz concert that was recorded on a cheap videocamera mic. I tried everything I could with DeNoiser (and with a couple of other noise-reducing plug-ins), but reducing the noise to acceptable levels affected the audio quality of the piano substantially. Still, it was an improvement, and I got my best results with Oxford DeNoiser. The Oxford DeBuzzer is designed to handle electrical hums and other steady-state noises. The trick with this kind of noise reduction is to identify the noise’s fundamental frequency. DeBuzzer then calculates the harmonics and uses a comb filter (in most cases) to reduce or remove the offending tones. Similar to DeNoiser, DeBuzzer has both Auto and Freeze modes. Auto is designed for situations where the fundamental might be moving around a bit (for example, on something recorded on a warbling tape machine). If the fundamental isn’t moving, then the Freeze mode works best. One of my tests of DeBuzzer was on a high-gain electric-guitar track that had a ton of buzz from a virtual amp and heavy compression and distortion effects. I used a combination of the tone feature and the waveform peak display to get a ballpark setting for the fundamental, at which point the hum was reduced considerably. I then tweaked it using the Fine Adjust option, which lets you set the fundamental in increments as fine as 1/10,000Hz. Just by moving the frequency knob around a little with Fine Adjust on, I heard the buzz drop off substantially more. DeBuzzer also handles high-frequency noises and whistles. I tried this out on the same piece of video soundtrack, and I was able to easily lock in on the offending high ringing sound and zap it completely away. I heard no degradation of the original audio at all. As an alternative to the comb filter, you can opt for a parametric EQ for sounds that have few harmonics. For this high-frequency ring, the parametric was the better choice. Overall, I found the plug-ins in Restore to be well-designed, fully featured, and excellent-sounding. That said, these tools require a major investment in money and time: Due to all of the adjustable parameters that they offer, they are not simple to use. The manual is less comprehensive than I would like (especially at this price point), but Sonnox provides a helpful Quick Start guide and an overview video that summarizes a lot of the basic functionality. If you only need audio restoration occasionally, this suite is probably overkill from a price, feature, and learning-curve standpoint. But if you’re producing video or audio that contains dialog and spoken-word segments, or if you’re doing a lot of restoration work on older music material (like LPs), or forensic restoration, you’ll find the deep, flexible, and excellent-sounding toolset in Sonnox Restore to be worth every penny. 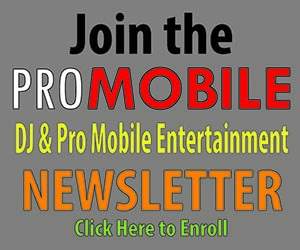 Mike Levine is Electronic Musician’s editor and senior media producer.